Pokédex Entry "They are kind but can be relentless when defending territory. They challenge foes with tusks that can cut steel." History Rhonda was born in Mistralton Cave in Unova. At that time, the huge expanse of caves were inhabited by a large extended family consisting of many members of the Haxorus evolution line. Rhonda had a normal, happy childhood alongside her family, making a lot of friends and sometimes even leaving the cave to play games outside, but not without the close supervision of a nearby adult. It was not often that a human intruded their home, but whenever such a thing occurred the bellow of an adult Haxorus was usually enough to send them packing. The years passed quickly and Rhonda grew taller and stronger. Sometimes the members of the clan would battle among themselves to level up, and when Rhonda felt that she was ready, she joined in. She grew quickly, and by the time she was an adult she had reached her fully evolved form. The cave was sometimes visited by other Pokemon species, and on one instance a handsome Druddigon called Aeron wandered inside. Rhonda greeted the visitor and introduced him to her family. The two of them began to spend more time together and became good friends. That friendship eventually sparked into a loving relationship and, just a year after meeting him, Rhonda laid two eggs. The two of them eagerly awaited the birth of their children, her mate having now been accepted into the clan. Several months later, two beautiful baby Axew emerged from their egg shells. They had a son and a daughter, whom they named Fredrick and Elinor. Rhonda was determined that her children had the same lovely childhood that she did, and so balanced out their play so that they could occasionally wander off to explore, even though she felt uncomfortable when they weren't around. Aeron was always there to reassure her that their children would be safe and sound. However, one day, Rhonda was resting when she suddenly heard a cry for help. Recognising it instantly, she charged to the sound's source with a bellow, ready to eradicate the threat to her children. It turned out to be a young human girl who had wandered inside, and had seen the two Axew and had decided to try and catch one of them. Rhonda realised with shock and deep upset that the girl had already captured Elinor. Knowing there was nothing she could do now, she glared at the human girl before turning back to the depths of the cave. But the girl promised that she would take good care of her daughter, and Rhonda believed her. It pained her greatly to let her little girl go, but she trusted that the human would keep her promise, and so took Fredrick away and returned to the main chamber where everyone lived. Rhonda swore an oath to herself that she would not let anything happen to Fredrick, and so began to forbid him to play with his friends unless she or his father were with him. Since her son was growing up and becoming more and more mature, he hated that he couldn't 'hang out' and began to resent his mother. Rhonda firmly stood her ground at first, but Aeron reminded her that her son was growing up and might not want to stay in the cave forever. Surely enough, the teenage Fredrick one day announced that he wanted to leave with Lucinda, a female that he had grown particularly friendly with. It agonised her greatly, but Rhonda let him go, knowing it was for the best. Tears rolled down her face as she said farewell to her son and to Lucinda, wishing them both the best of luck and reminding them at least five times to come and visit one day. They never did. The years past and Rhonda never saw her son or his mate again. She told herself that he now had a life, a family and a new home, possibly far away. She tried to believe that he was happy now, and was living his life the way he wanted to. She missed her children greatly, and wanted nothing more than to be back with them both. Rhonda eventually found solace in Aeron and in the rest of her family, and continued to live her life happily. It was many years until news of an epidemic began to spread. An Unfezant, acting as a messenger to all the reclusive clans in the region, entered the cave and warned them all of a mysterious, deadly virus that had nearly destroyed Johto and had been rumoured to have been detected in Unova. The family of dragons were unsure of what to do until two of them returned from a scout with a fresh batch of nasty wounds that simply refused to heal. Surely enough, within a couple of days they started to behave differently, hosting an aggression that neither of them held previously. One day, they attacked, ripping their own family and friends to shreds with their tusks and feeding on their flesh. Rhonda, now one of the Elders, took on the duty of leading the younger ones to safety. They made it outside, only to see that their region was one giant massacre. Determined to get through it, Rhonda and the other survivors tried to find a safe haven in the chaos, but never found it. They were being picked off one by one, and soon it was just Rhonda, Aeron and a few other lucky ones left. They were cornered by a pack of undead Zoroark and quickly overpowered by the bloodthirsty foxes. When just herself and Aeron were left and both wounded, the old Druddigon yelled at her to go and that he would catch up. Unable to stand any more bloodshed, the terrified old Haxorus fled to the sound of Aeron's dying screams. Rhonda, being as strong as she was, became determined that she would survive all this, not only for Aeron but for her children too. She now travels wherever she can, hoping to catch a glimpse of either of them alive and well. Appearance Rhonda is a slightly larger Haxorus than most, but otherwise looks normal for her kind. Despite her fearsome appearance, she is gentle and carries herself with regal grace. Personality Rhonda's large and intimidating appearance does not mirror her personality at all. The old Haxorus is kind, gentle and calm. Rarely losing her temper, the dragon maintains an optimistic approach to life, even if it sometimes seems a little forced. She is determined to survive at any cost, and knows that she must try to look on the brighter side if she is to achieve this - thinking back to all of the terrible times since the epidemic started and losing her will to live would not be what Aeron would want. Rhonda is scared of the undead and will avoid them at all costs, choosing only to battle when it is necessary. While by herself she will often flee a battle, when she makes friends it is a different story - she is fiercely protective and will unleash all of her power to defend a close companion. 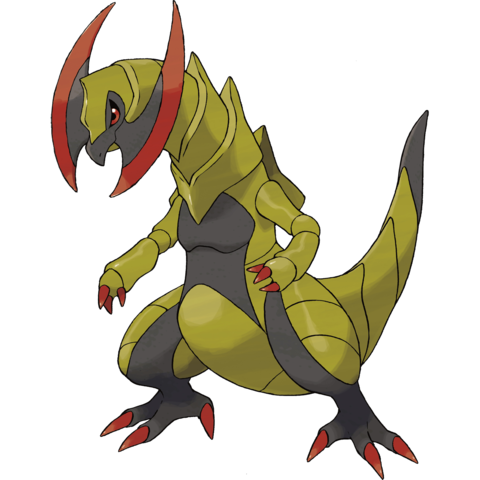 The Haxorus possesses a very motherly nature and adores children, putting their safety above hers and looking out for them at all times. Rhonda is not shy at all, and is never afraid to approach a fellow survivor. Due to once being one of her clan's Elders, she is more than capable of taking charge of a situation should there be a need for it. Rhonda is proud of her strength and does not like to lose in battle. Rhonda is not only strong physically, but mentally as well. She can withstand many a situation while maintaining her calm exterior, even if anger or sorrow are threatening to break through the surface. She often struggles, but more often than not she can get through a bad situation without showing a hint of negative emotion. She believes that there is no use for tears or temper at a time like this, knowing that losing control of her emotions would only lead to bad things for her and others around her. It is very difficult to make Rhonda angry but if it should happen, she is truly a force to be reckoned with. --Getting a little slower on her feet because of her age. However, she is still a powerful fighter in battle. --Her worst nightmare is to become infected, so will stay away from the undead as much as she can. --She is not too keen on humans and finds it very hard to trust them.